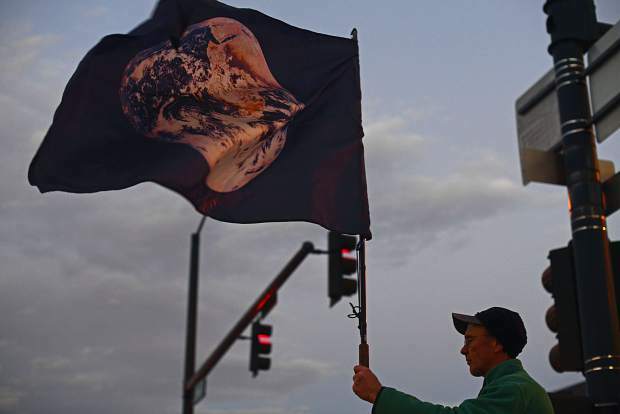 A protestor waves an earth flag outside the Alfred A. Arraj Courthouse in downtown Denver during a Friday protest supporting a case to give the Colorado River personhood. A federal judge has dismissed a case seeking personhood rights for the river, after the plaintiffs' attorney agreed with the state of Colorado that he should pull the case. Flores-Williams filed his own voluntary motion to dismiss on Sunday, two days after he gathered with nature activists outside the federal courthouse in downtown Denver. The group passed around a bowl of water from the Colorado River and played music affirming their commitment to creating a legal right to nature in U.S. courts.